In our last Monday Motivation post I wrote about self-motivation and what a struggle it can sometimes be. In that post, I also mentioned we'd be talking more about gamification in the future as a way to keep yourself motivated to write. Today we're going to start by looking at one example of gamification for writers: setting writing challenges for yourself. I don't know about you, but I'm a sucker for anyone or anything that challenges me. And if I find no challenge in something I'm doing, I tend to get bored quickly. While I love proving something to other people, proving something to myself can be equally motivational. So writing challenges, as well as personal challenges, are going to be a big part of my life in coming months. One-off challenges are a fine place to start. These would be things like New Year's resolutions. But they're not enough. It's too easy to walk away from these or push the target date back. If you push yourself with a new challenge on a regular basis, you might find yourself feeling a little more motivated because that end date isn't as flexible. You have something else already planned for the coming week or month. 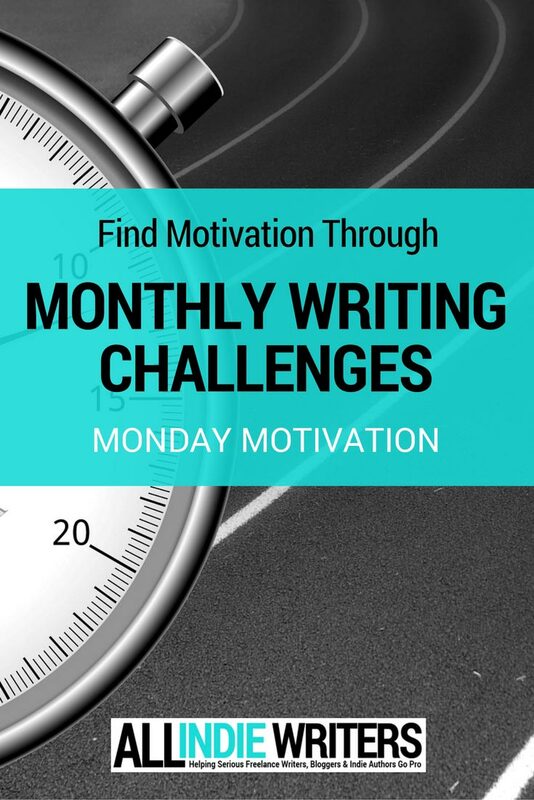 While you should choose a challenge frequency that works for you, I'm going with monthly writing challenges. On the personal challenge front I'll have a mix of monthly and weekly ones. First, the end results are more significant (like finishing a rough draft of a novel) than they would be with a shorter deadline. Second, they keep me focused longer. It's much too easy to say "Meh, I'll skip a day, or a week, or whatever," thinking you'll get back to those smaller challenges soon enough. Then you never do. If you think monthly challenges would work best for you as well, here are some examples you can try to get started. Here are ten ways you can challenge yourself next month as a writer. Finish the rough draft of a novel -- Think NaNoWriMo, but on your own schedule. Write a poem every day this month. Write at least one short story every week for a month. Write one piece of flash fiction every day for a month. Send 30 freelance writing queries or LOIs over the course of a month. Write one blog post per day for 30 days. Challenge yourself to simply write every day for a month. Choose a marketing activity you want to spend more time on and do that every working day for a month. Set a month-long challenge to sell a certain number of books or e-books. Give yourself a month to launch a new blog. You can tie your challenges to writing itself or to the business side of things -- whichever you need that motivational boost for. When it comes to any kind of challenge or goal, I'm a big fan of using rewards systems (and this is a big part of the whole gamification concept of making your work even more fun). While it's not necessary to do this, you might find you stick with challenges more when there's a real reward of some kind at the end -- earning enough for a family outing you've been wanting to take, being able to buy yourself something nice (from a new gadget to some new books you're dying to read), or anything tangible you want. It's nice if the reward is directly tied to the work you do during the challenge, because every task you complete will remind you of the end game. For example, in a previous forum thread here I mentioned a reward I might set for publishing a book would be a long weekend at Sayre Mansion's library suite. It's one of my favorite places to go for mini writing retreats -- an ideal reward, but also an opportunity to jump right into writing the next book. But it's not necessary to have that kind of direct tie. Even tangible rewards in general aren't necessary. Sometimes completing the challenge is a reward in and of itself (especially if it's something someone else tells you you'll never be able to do -- very little motivates me more than proving someone wrong when they underestimate me). An example of this might be NaNoWriMo again -- the reward is knowing you've just written a novel. That's pretty impressive in its own right. I could have waited until January to start setting regular monthly challenges again, but I figured it was better to get a jump on things. Then, when the time for bigger goals and resolutions comes around, I'll (hopefully) already have a little bit of success behind me, motivating me to do those bigger things. Here are my December challenges to give you an example of what you can do and how these challenges might end up being their own rewards. For December, my challenge is to build a new blog. You may remember me announcing a 3-month challenge several months ago. I was going to launch a site in the indie horror niche, document the progress for three months, and share the results with you here. That was delayed a bit because I overhauled some business plans this year that put my work in the horror genre on the backburner. So it didn't make sense to launch a new site in that niche right now. I'd been looking for a new niche to get this longer challenge going so I could share the early launch phase progress with you, but I didn't decide on one until yesterday. While I'm not sharing much about that yet -- you'll learn more next month -- it's a nonfiction blog in what I suppose you could call a micro-niche. December is when I'll build the blog, set up the theme, write the initial content, and finish working out a monetization plan. If I succeed with that challenge, it will launch on January 1st, kicking off the 3-month challenge (which my next few monthly challenges will be tied to). I consider having a new blog, and a new income stream, to be enough of a reward all on their own in this case. In addition to a monthly business-related challenge, I'm taking on a monthly personal challenge as well (maybe even more than one). This is simply about bettering myself in one small way at a time. For December, that challenge is pretty simple: work out every single day. That's not too far off from where I already am, but the workouts are designed to be much more intense and quite different from what I'm doing now. I recently set new weekly goals for myself on the health and fitness front, and I broke them down into a daily plan. Then I created index cards for each day of the week, detailing what I'm supposed to do. The challenge next month is to simply stick to that plan all month long. It's designed to be a tough challenge that will range anywhere from 30 minutes to two hours per day, depending on what else I have scheduled (so even though there are no full rest days, I do have an easier one scheduled to give me a bit of a break -- that day will mostly be yoga). I don't have a specific reward in mind for this. I've mentioned my past health issues here before and how this year I've lost a lot of weight without really trying now that that's resolved. But it happens in short spurts with rapid weight loss followed by a few months where I seem to plateau no matter what I do. I think I've figured out what kicks my system into those phases though, so this is my way of testing that theory. If I prove myself right and can continue it, that's more than enough of a reward. (What can I say? I like being right.) If I lose a few pounds in December rather than gaining a few over the holidays, that's just a bonus. But no matter what happens, I suspect it'll help me kick off the New Year feeling better and ready to tackle even more. In addition to the monthly challenge, I've also set tougher weekly challenges just to push myself for the heck of it. That might mean doing an obscene number of push-ups, squats, or crunches one week or walking significantly more miles than usual another week (though I'm not counting walking as workouts at all for this). Again, I have no special rewards planned. These ones are just for fun to prove to myself that I can step things up a bit. I'm hoping those shorter-term successes will keep me motivated for the longer one -- yep, I need external motivation to get through my main motivational activity. Those are my plans for December. It'll be "interesting" given the holiday month. I take half of December off every year. That will be good for the personal challenge because I'll have more time each day for the last two and a half weeks or so. It might make the business challenge tougher though, because I only have about two weeks to get the blog ready for launch (unless I work through some of my vacation time, which I'm OK with). For the gamification aspect of this, pushing myself towards a goal and seeing if I can actually do it is enough for me. But look for ways to make it even more fun if you need an extra push. Think in terms of being on a quest for whatever that end reward is for example. Or bring a friend on board if they'd benefit from the same challenge -- even compete with each other if that helps. What about you? Do you routinely set challenges for yourself either personally or professionally? If so, tell us about a successful challenge, the one you're working on now, or what you're planning for next month, and let us know how those challenges help keep you motivated. First of all, Jenn, I’m looking forward to the new horror blog. I’ve posted a few horror-related posts on my site (a review of the film Oculus, the intersection of literary and horror fiction, for example) so would eagerly look forward to see what you come up with. NaNoWriMo couldn’t work for me this year due to my job situation but I agree it’s a great test of writer’s focus and endurance, so maybe next year. I’m sorry. 🙁 The horror blog was the original plan, but the one I said I’m not doing after all. It doesn’t make sense for me to invest time in a site under my pen name in that niche right now when I’m not pushing my horror fiction for the time being. The site plan was changed to something more business- and writing-oriented in line with my area of expertise, and I’ll likely run the site on a first-name-only basis so it doesn’t benefit from any name recognition in the niche. I’ll probably announce more about it later this week or next, as soon as I finish the site plan. 1. I tackle the list using the Pomodoro technique. 25 minutes on a task. 5 minute break away from my desk. Repeat that 3 times, then do another 25 minutes of work, followed by a longer 15-30 minute break. You can always use those breaks to tackle the other things that come up without distracting you from your to-do list. 🙂 I tend to use the shorter breaks for quick bursts of housework or short rep sets to work on my arms, legs, abs, etc. in addition to normal workouts. If you don’t have other things to do, the 15-30 minute breaks are a good excuse to go outside for a short walk. It either gets the blood flowing which perks me right back up or I accomplish something useful which gives me a motivational boost. 2. The other thing I like to do is break my to-do lists down into itty bitty parts — my 5-minute lists — as much as possible. This way, when I find myself getting distracted, I can go to that list, pull one short task up and finish something within about 5 minutes. Checking one thing off the list always makes me want to keep going. I get incredible satisfaction out of checking something off my list. If you’re like that at all, give it a try. I honestly don’t think I’m going to finish NaNo this year. Had I not started on a separate story early on and wasted several thousand words before switching, I would have. It’ll take a hell of a two days for me to manage it. Maybe. But not feeling good about it at the moment. I also have a big blog post I need to finish to close out the anniversary month tomorrow, and that has to be the priority. 🙁 On the plus side, I’m happier with this story than any other I’ve worked on for NaNo in the past. So if it’s a few thousand words short of the goal, that’s OK. It still got me moving on a project I’d shelved for 7-8 years. You can’t win everything!